So let’s see if I can shed a little light on the subject and at least let you know which ones to look for and where. This list WILL be a bit biased. If you’ve read anything here you know I’m a Laticrete diehard. It is, and will continue to be, my preferred manufacturer for nearly every tile and stone setting material needed. That said typed, I do realize that other companies exist. Just like modified thinsets, there are different levels or grades of unmodified thinsets. This is normally measured by the ratio or percentage of cement to sand in the mix. The higher the cement content, the better the thinset. More cement, more sticky, more stable. It is also, in part, due to the type and percentage of whatever retention product is in the mix. For most thinsets (as far as I can tell – ancient guarded secret and all…) a powder called ‘hydrated lime’ is used. It is the same lime used by brick masons in order to retain water in the cement mix for a longer period of time, thus making the cured product stronger. So that’s how unmodified thinsets are ‘grouped’ or graded – the ratio of those three items in the mix. Now that you know that, let’s group them in order according to how they are graded and perform. I’ll do this by manufacturer since most people only have one or two specific brands available. Laticrete 272 is considered the premium (best) – then Laticrete 317. There is negligible difference in these thinsets unless an admix is added to make them modified. For use as an unmodified I prefer the 317. Although they classify the 272 as their ‘premium’, they’re nearly identical. LATICRETE 272 is slightly finer so it is a little bit creamier.” (Thanks to Anita at Laticrete for this clarification) The 272 contains 25-35% portland while the 317 contains 20-30% portland. On the consumer side Laticrete products often have a different name – you may be familiar with Laticrete MegaBond. That is nearly identical to the 317. I use 317 for almost all of my unmodified thinset needs. 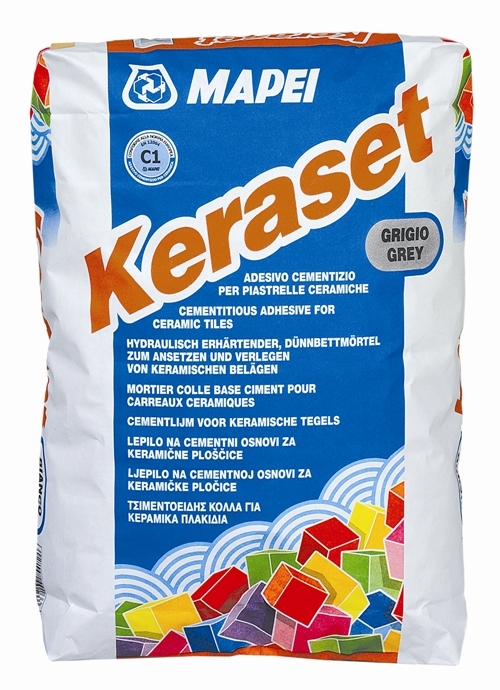 Keraset: This is Mapei’s mid-range unmodified. It’s not ideal but it works if it’s the only available. Give it extra time to fully cure! If you use Keraset be sure to wait a FULL 24 hours, at least, before the next step. 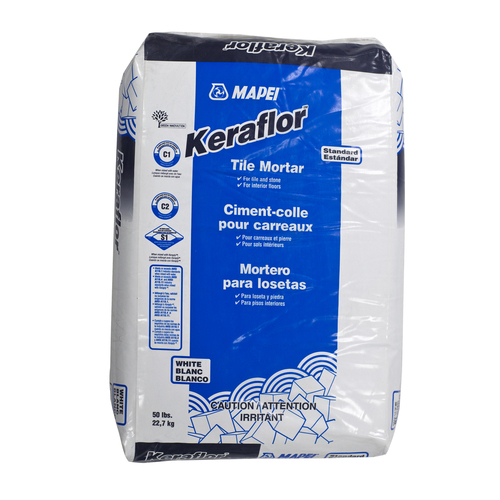 Keraflor: The ‘economy’ level unmodified from Mapei. 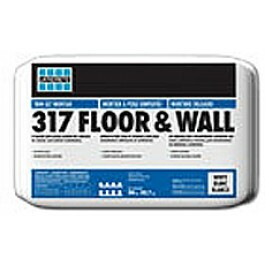 I would not recommend using it for any shower applications or any regularly used flooring surface over ditra. Best to find one of the other two. Uncoupling Mat Mortar: This is Custom’s premium unmodified mortar made specifically for Custom’s spiderweb mat and other ditra-like products. It is difficult to find and has limited availability. If you can get your hands on it, use it. *This is by no means any type of intentional slander or slam against Custom building products! They make some great products. Masterblend, however, is not one of them in my opinion. And that’s all this is – my personal opinion. I do not consider this a viable product with which to install tile or stone over Schluter products. Sturdi-Set: Tec’s premium unmodified. A good unmodified thinset for nearly anything requiring one. Full-Set Plus: Tec’s other unmodified. Comparable to a mid-range unmodified. It’ll work in a pinch if needed, but ensure full cure time before the next installation stage. 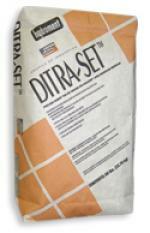 Ditra-Set: This is the best product with which to set anything over kerdi or ditra – it was specifically manufactured for that purpose. The availability is extremely limited, however. Most professionals don’t have ready access to it, let alone regular homeowners. So just plan on not finding this. If you are lucky enough to find it you’ll feel ecstatic, like the luckiest person alive! If you don’t find it you’ll just think ‘Well, FloorElf told me I wouldn’t find it…’. See – win-win for me. Yay. So there you have it. The most commonly available unmodified thinsets and where they rate on the scale of quality. As I stated, this list is biased. The list above is the order in which I would use them if given the choice. Regardless of the order under each heading (Best, Works, etc.) this is how they are rated by their respective manufacturers. Do not be surprised if you cannot find one of the quality products easily. They are not commonly stocked by regular big box stores except for the Laticrete Megabond. The best place to look for any of them would be at a tile supply shop. If, however, you are limited to normal big box stores, you can find some of the common products there. Lowes will either stock Laticrete or Mapei. Home Depot will only (currently) carry Custom products. 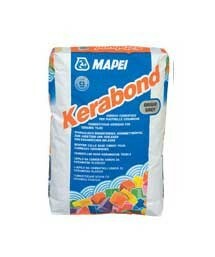 Menards normally stocks Mapei. Beyond those three, I have no idea what you may have around you. You can always check the respective company’s website to find the nearest supplier. Since you will be looking for one of the more uncommon products keep in mind that just because you have a supplier near you does not mean you’ll find that particular product there. It’s always best to call the customer service line and ask them directly where you can buy the product you want. One last thing – before anyone asks: adding more portland cement to a particular product may or may not make it better. 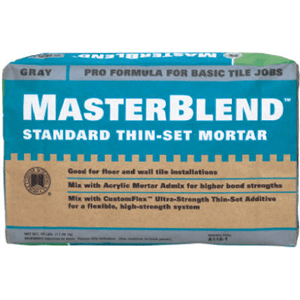 Adding more cement to masterblend, for instance, will not make it comparable to kerabond. It doesn’t work like that. These thinsets, as all tile installation products, are put together in specific ratios in order to accomplish what the company wants. It may work, and it may not work. Unless you personally know someone in the chemistry department of the manufacturing plant there is no accurate way to tell. All thinsets, as well as any tile installation product, will have a specific ANSI (American National Standards Institute) number on the bag. This determines what type of product it is and what ANSI standard it meets. The number for unmodified thinset is A118.1. The ‘.1’ at the end determines the unmodified version. If you find a thinset you are curious about, and it is not on this list, look for that number. If it has A118.1 AND more numbers after that (with no mention of admix) then it is a MODIFIED thinset. For instance, if it says on the bag that the product meets ANSI standards A118.1, A118.4 and A188.11 then it is a modified thinset. All modified thinsets meet the criteria set forth for unmodified thinsets as well, that’s why the A118.1 is on there. ALSO! (I know it’s a pain, I live it) Most bags of UNmodified thinset have the A118.1 number as well as the A118.4, possibly A118.11 also If it does it will plainly state that it only meets the last two standards (for modified) when mixed with the appropriate admix. Masterblend states that it meets all three – with the addition of admix (liquid latex). Don’t let this confuse you. They cannot legally misstate the ANSI numbers. I hope this helps clear up a little bit of confusion about these products and helps you determine which would be appropriate or best for your project. As always, if you have any questions please don’t hesitate to ask them below. I answer them all. I’m just super cool like that. Hello! Mapei came out with an “Uncoupling Membrane Mortar” that goes for around $15 a bag at Lowe’s. I’ts on Schluter’s “approved” list for tile installation per thier PDF guide, but I haven’t found any professional commentary on it online. Have you had any experience with it? Please Help! I bonded the Schlutet shower tray to finished plywood subfloor with unmodified CustomBlend. It set, days later, the bond layer is turning to dust. I will redo this, but since I am bonding plastic to plywood, can’t I use epoxy or some other appropriate adhesive? Okay, I should not have used CustomBlend, but why do I even need to use mortar at this step? Thanks for your help. Use All Schluter products for this. You will NOT have a warranty with using anything else. I want you to read more of the details and instructions on how to place a schluter shower tray so I’m not going to give you the details. Visit their website they have great how to videos. And btw CUSTOM building products are junk. Your site has been such a go to resource throughout my first attempt at renovating a bathroom… Thank you! I decided to use the Schluter systems, and have been using the Laticrete 317 (as you advised!) but have run out and still have the floors to do. My local tile shops were out of the 317 and have suggested a product from Texrite called “Floor Mix” (it does meet the standards, but like some of the others on this list, I’m afraid it may not be worth using!). Any thoughts/experience with this product? One person went so far to say this is the same 317 in a different package but I thought I’d ask another expert! The problem is that a LOT of people do not have that available anywhere near them – including myself. If I want it I have to drive to Denver, I’m not doing that. Availability is normally the biggest factor in choosing an unmodified mortar. I just order mine off of Amazon if my supplier is out it is a little more expensive but I feel confident in it. But it is tough to fine sometimes for sure. I checked amazon but at $40+ a bag that didn’t work. Found it online Floorlife just over 20 a bag and since doing multiple rooms ordering 15 bags was cheaper than amazon even for their delivery. I’ve never seen nor heard of that, but I will tell you it definitely is not 317 in a different package – that’s BS. A good indicator of the quality of a mortar is the price – find something that is around the same price point of the 317 and you’ll be fine. Yep! That is what I was afraid of! At only $6 a bag, I thought it couldn’t be right! I found a local flooring store that can order in the 317… I’ll just use the down time to dry fit and cut a million little hex tiles. If you have tips for cutting small mosaics (I’m planning now to use my wet saw) I’m all ears. Schluter Set White 50 lbs Bag UNMODIFIED Thin-SET MORTAR which was cheaper. Is theirs better? like everyone I don’t have a lot of money and this is a big project for me 350 square feet kitchen/laudry/hall and pantry. porcelain tile also very expensive but going over a concrete slab. Already have the ditra but as it’s a dyi I cant afford time or money for cracking tiles or the product to fail on me. I’ve been waiting years to do this project and want to make sure I’ve got the right materials.Please take a moment to give your suggestion. Schluter thin set is awesome. I love the ALLSET Because you can use it anywhere. 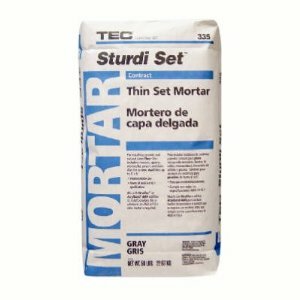 Schluter set is actually the perfect mortar for your application. It is awesome stuff. I did go with the schluter thinset bought it online at just over 20 a bag. Even with shipping the cost was less than I had planned on. Thanks for the feedback. Hi! Thanks for the very helpful website. I recently started a kerdi application and used the only unmodified thinset I could find at lowes. I think it was worse then the keraflor you mention. it was just a $8 bag of mapei unmodified thinset. I knew nothing of the premium levels. It was like sticking cardboard to dirt. I knew something was wrong but couldn’t figure out what since the bag of mortar said it met the standard. Nothing in any of the product literature mentions “premium.” I had to get it so thin, saying it would hold the trowel lines was a stretch. I know you would have to see the actual finished product to make any real recommendation but curious what your thoughts are. You mentioned “it’s a last call” so i guess you are not saying “absolutely not tear it all down.” Right? I do a water test tomorrow…. I would check the bond after the thinset cures. You would still be able to peel it off if you tried (you can with any thinset) but you would need to put effort into it, it won’t peel up like a sticker. Your flood test will tell you everything you need to know. Thanks. I failed the water test so bought some schluter thinset. Was night and day difference. Very sticky, good bonding. I trimmed an edge of the existing wall membrane held by the cheap thinset and it came right off even falling off in sections. Going to hope that was just some poor bonding near the edge and keep going but really wish I had started with some better thinset (seen this website sooner). Several years ago we installed the Ditra in our bathroom then tiled it. We are now updating the tile so we’ve taken all the old tile and Ditra out. The tile and Ditra came out with some hard work and power tools. We had some exposed plywood and some thinset left on the floor. I went to Lowes and the associate sold me the Mapi Kerabond T thinset fill in the pockets of missing thinset from the plywood and to lay the new Ditra to the floor. We levelled out the floor and let it dry for two days, then layed the new Ditra. It has now been drying for a few days. We have been doing a lot of reading and research on what products to use below and on top of the Ditra but we are just confused. Having read that the Kerabond T is unmodified, not modified, have we already set our project up to fail? Also, can you please recommend a thinset to apply on top of the Ditra for use with a porcelain tile. If you used unmodified over plywood it may fail. I can’t guarantee a failure – it may be just fine. It depends on the amount of expansion and contraction in your floor. Unmodified can not handle very much, it isn’t flexible at all. With ditra over wood it needs modified between the wood and ditra. Between the ditra and tile always requires unmodified.